The Academy sits directly across Fifth Avenue from one of the loveliest areas in Central Park: the Conservatory Garden. It’s a favorite lunchtime spot for Academy librarians, and lately we’ve been enjoying an array of avian visitors. We’re in the midst of fall migration and New York City is on the Atlantic Flyaway bird migration route, with hundreds of species of birds flying through. 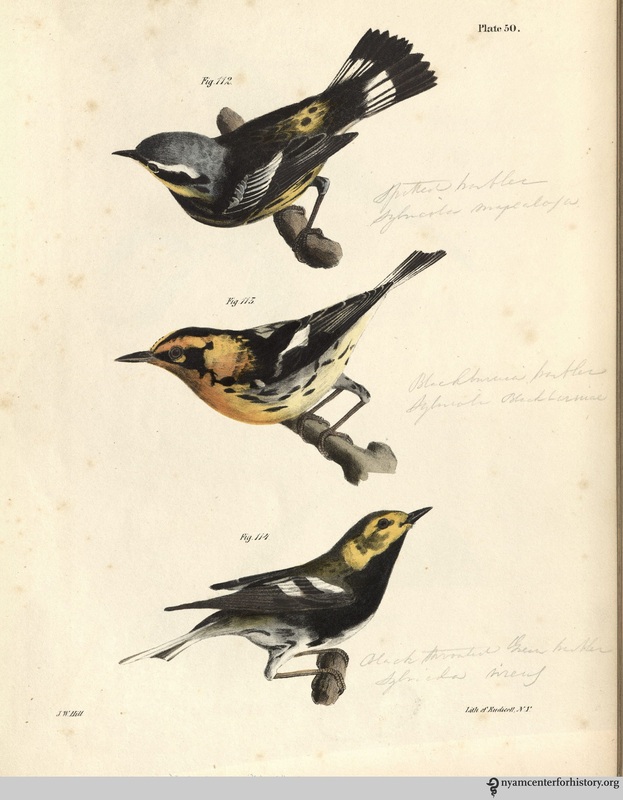 Inspired by our feathered friends, I want to highlight a series of reports on New York state wildlife published in the 19th century that also features hundreds of species of birds, along with other animals, plants, minerals, fossils, and more. In 1836, the New York State Legislature approved a plan to conduct a geological and natural history survey of the state. This survey took place from 1836 through 1840 and resulted in an epic 22-volume set of reports on New York’s zoology, botany, mineralogy, geology, agriculture, and paleontology, published from 1842 through 1867. 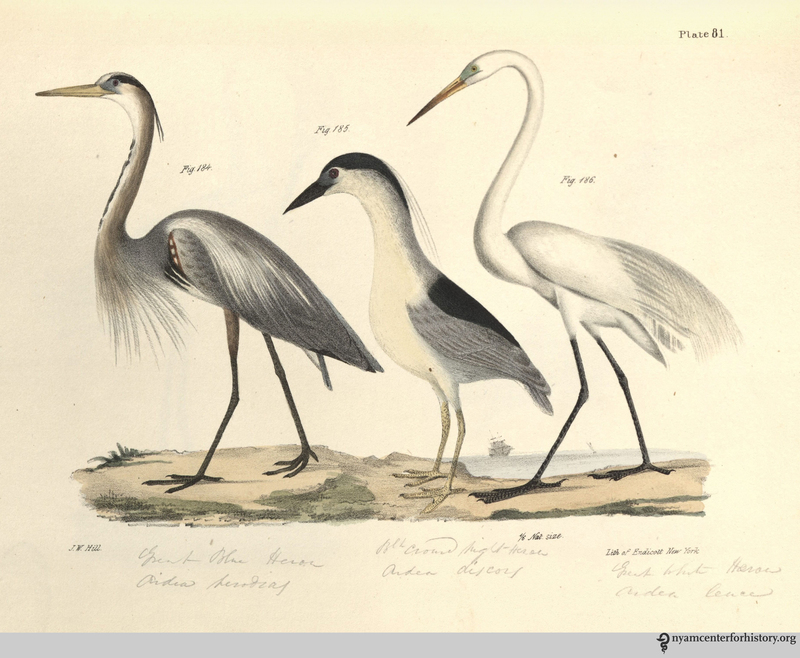 Left: Plate 81, Great Blue Heron, Black-crowned Night Heron, & Great White Heron; Right: Plate 118, Ruddy Duck & Buffle-headed Duck. 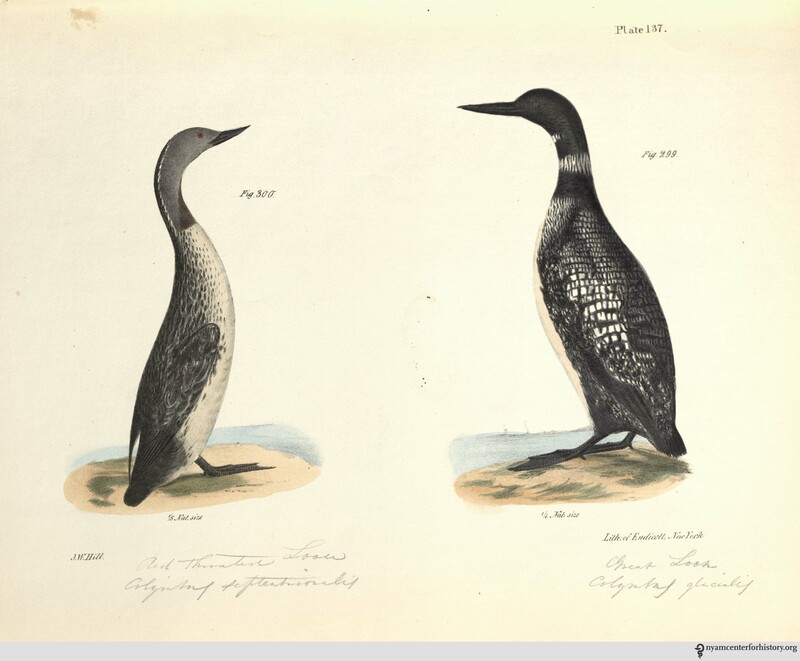 Left: Plate 137, Red-throated Loon & Great Loon; Right: Plate 40, Red-bellied Nuthatch & Red-throated Hummingbird. Economic interests figured highly in New York’s survey, but it was also prompted by a desire for scientific knowledge. Curiously, the work begins with a far-reaching, 178 page introduction by Governor William H. Seward, detailing such varied topics as “a geographical and political description of the state;” “a notice of the theological profession;” “an account of the formation and establishment of the constitution of the United States;” and “notices of the application of the steam engine to navigation.” It is not until page 174 that Seward begins to discuss the survey, writing of geological studies that preceded it and the surveys of other states. Seward briefly describes some of the geological and mineralogical discoveries (including the disappointment of not finding coal) and makes little mention of other kinds of natural resources. 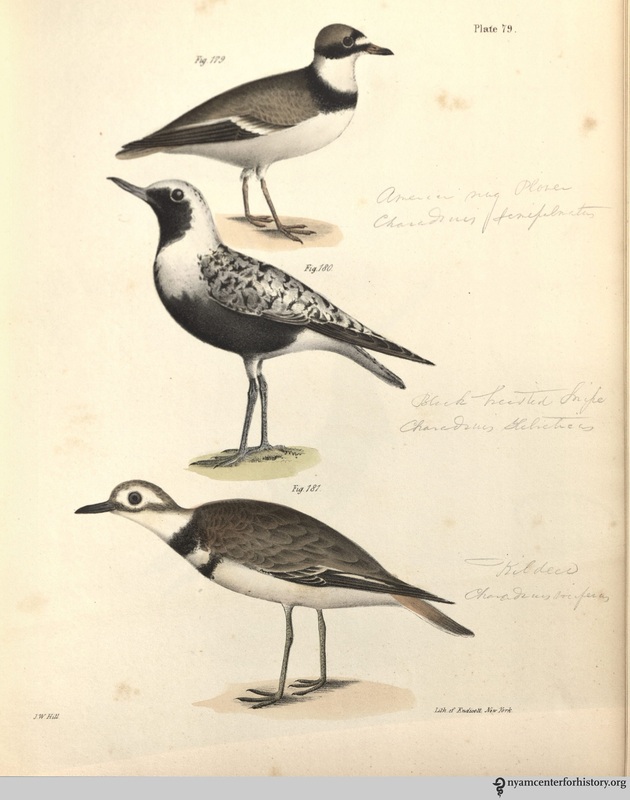 Left: Plate 50, Spotted Warbler, Blackburnian Warbler, & Black-throated Green Warbler; Right: Plate 79, American Ring Plover, Black-breasted Snipe, Killdeer. Still, the survey did include zoology, botany, and even paleontology. The zoological study was led by the zoologist James E. De Kay and the reports were published in 5 parts, covering mammals, birds, amphibians and reptiles, fish, and mollusks and crustaceans. 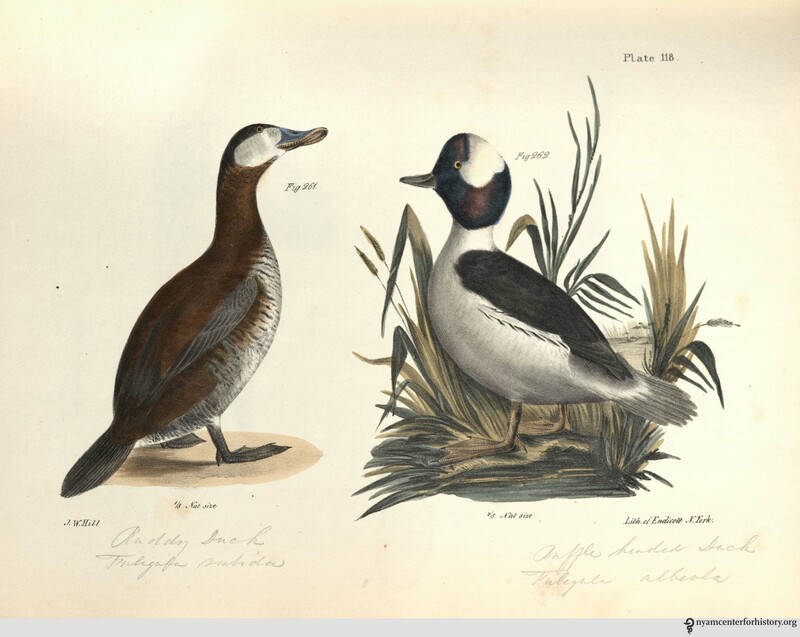 All are beautifully illustrated, but the volume on birds is the largest, with 141 hand-colored lithograph plates. 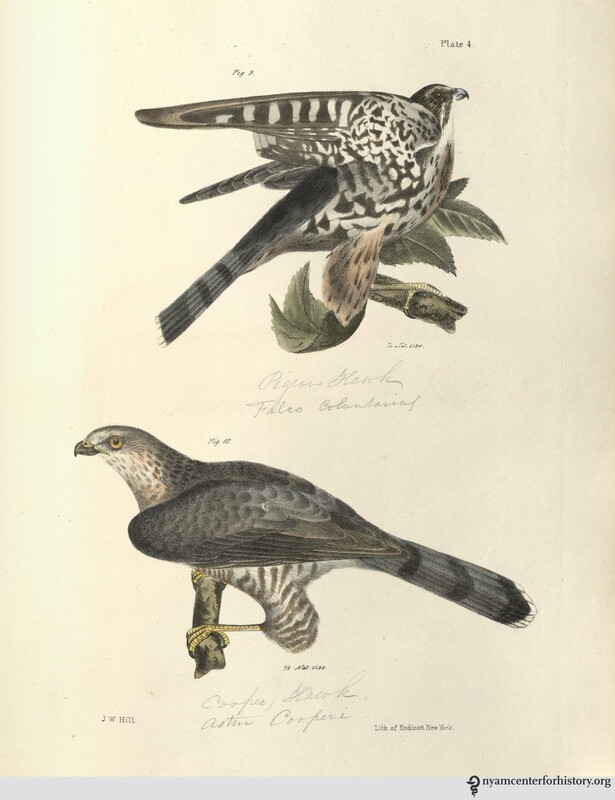 As De Kay explains in his preface, the illustrations are by the artist J. W. Hill and most were based on a living animal or mounted specimens. Initially, the illustrations were meant to be engravings and most of the mammals are engraved, but due to the expense and time involved, they switched to lithographs. There was some anxiety over this change, and De Kay writes “We hope that in the lithographies furnished by Mr. G. Endicott, the naturalist will not regret a departure from the original plan.” I can’t claim to be a naturalist, but I don’t think he should have worried; the plates are almost as striking as the birds we see in the park. 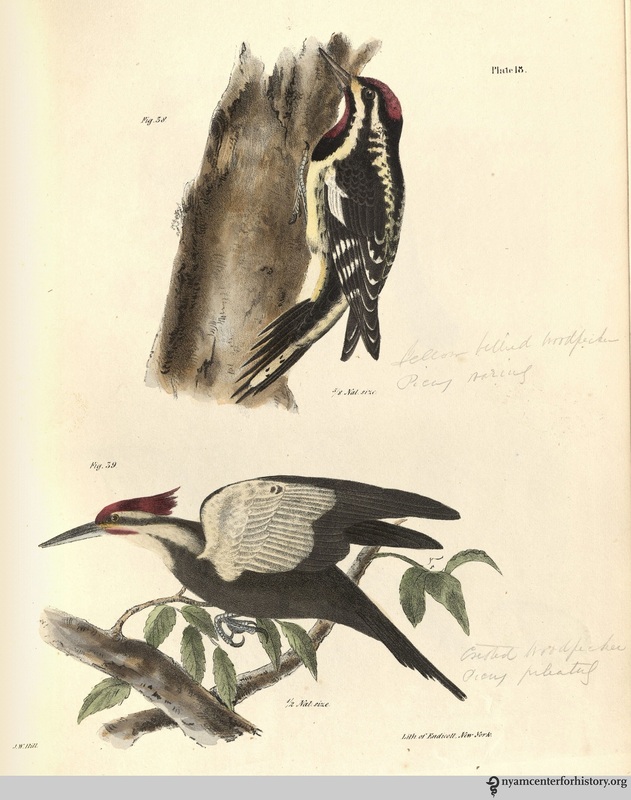 Left: Plate 18, Yellow-bellied Woodpecker & Crested Woodpecker; Right: Plate 4, Pigeon Hawk & Cooper’s Hawk. Newcombe, F. C. “The Scope and Method of State Natural History Surveys.” Science, New Series, No. 956 (Apr. 25, 1913), pp. 615-622. Retrieved 9/21/2017. * The work of the New York State Natural History Survey continues today in the New York State Museum; the Museum was established as part of the survey in 1836. 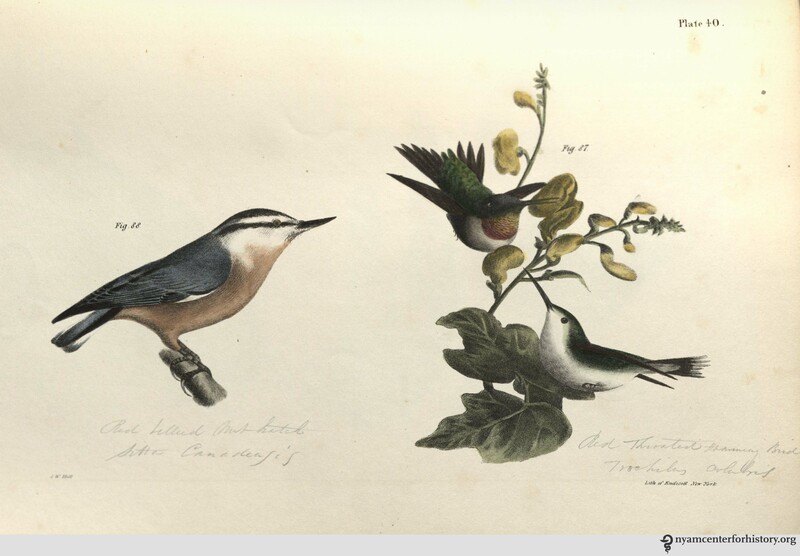 This entry was posted in Collections and tagged birds, New York, zoology by nyamhistmed. Bookmark the permalink.